Like all significant artists, Brian works from a deep and complex and evolving frame of reference. Unlike most artists, and like most scientists, he talks about that frame of reference. He's not worried that your experience of his art might be sullied by your understanding something about what he's up to — rather the opposite: he would like to include you in the process. This is risky, but valuable. It's risky because once viewers or listeners know what the artist is attempting, they have criteria for judging when he has failed. Brian's approach is valuable because it is so inviting. The informed viewer or listener is invited to think like an artist and therefore in a sense to become an artist. This is good for art and good for civilization. I think that's what makes Brian's book, A Year With Swollen Appendices, so appealing. Brian is famous, and that makes us interested, and he's charming in print as well as in person, so we engage him comfortably. But what gets us about the book is how revealing it is. We see what a good artist does with his mind all day. It's inspiring. There's a further benefit to telling all, this time to the artist. By not keeping his frame of reference secret, Brian is freed from binding allegiance to whatever he was thinking when he first became successful. You don't cling to secrets you've told. You move on, and your work keeps being surprising as a result. Maybe this approach works best with artists who are easily bored. Brian is, after all, the author/composer/performer of the tune (now a well-known meme), "Been there, done that." JB: Let's talk about your theory of culture. ENO: I guess the question I've always been really interested in, the one that underlies all the others, is alluded to somewhat in my book and I've written about it more since, which is to try to find a big theory about culture: why people do culture, what it does for us, what we actually call culture, which things do we include in that category, and which things do we leave out. I have two intentions in thinking about this. One is that I want to find a single language within which one can talk about fashion, cake decoration, Cezanne, abstract paintings, architecture ÷ within which one can discuss any what one might call nonfunctional, stylistic behavior ÷ which is what humans actually spend more and more of their time doing. The better off humans are, the more time they spend engaged in issues of style, essentially ÷ making choices between one look of things and another look of things. The first question is to say "is there one language within which we can talk about all of those things?" There doesn't have to be a separate language for fine art, so-called, separate from anything else we talk about. There should be one language that fits these things together. The second question is to try to say "is there a way of understanding why humans continuously and constantly and without exception engage in cultural activity?" We don't know of human groups that don't produce something that we would call art. It seems to be something that we are biologically inclined to do. If we are, then what is the nature of that drive? What is it doing for us? When people say, well surely this has been written about, what I say is, actually it hasn't, really. The number of books on this subject is vanishingly small. They occupy a shelf about 18" long. What has been done is a huge sort of taxonomy of cultural artifacts; people sort of listing things and saying that looks a bit like that, and these seem to belong together, and so on and so on. But I always say that this is a little bit like natural history before Darwin came along. Before Darwin there were lots of observations, there were people noticing all of these things existed, making careful notes about them, talking about them, saying that this related to this, this was higher than that or lower than that, and making all the sorts of judgments and observations that people now make about cultural behavior. When Darwin came along, what he said was very simple, very easy for anyone to understand, ÷ and extremely profound, because it gave one language ÷ the language of survival and the drive to survival and selection and so on. He gave one language in which one could frame all of the things called living organisms. By doing that, it made that subject not just a way of collecting heaps of material, but of actually making theories about that material. In a way he brought to an end the sort of gathering stage of natural history, the stage where the job of a natural historian was just to go out and make observations, and he brought into being the next phase, which was the task of somehow relating things together and making extrapolations and predictions, and saying if this happens, we might expect that this would happen. That's the job of science. JB: But you're an artist. Why are we talking about Darwin? ENO: Most of the questions I'm interested in about art and culture really are based on trying to look at them with some kind of big theory of that kind, which is not oblique, not mysterious, is quite easily graspable, and would allow a real discussion about culture. It's partly because I think most art writing is absolutely appallingly bad. My first mother-in-law, that's to say the mother of my first wife, was a very interesting woman who lived in Cambridge, and had a salon, at which quite a lot of very good scientists would appear, Francis Crick, John Kendrew, Herman Bondi, among others. Her name was Joan Harvey and she ran a thing called the Cambridge Humanists. She's a very bright and interesting woman. I met her daughter, and was taken home, and got along very well with Joan. I was 17 at the time. One day Joan said to me, it's all very well what you do, but I just don't understand why someone with a brain as good as yours wants to waste it being an artist. This question cut me to the quick in a way. I came from was working-class where nobody particularly cared what you did. It was the first time that anyone had ever cared. Then I fell in with a lot of arty people, who of course assumed that being an artist was a wonderful thing, and never bothered to ask the question about why ÷ about what the point of it might be, or what it actually did for anybody. Joan asked that question, and I never stopped thinking about it. That was the beginning of an interesting double life, because part of my life of course is being an artist, but the other part, and just as interesting to me, is wondering what it is I'm doing, or what everybody else is doing ö asking what it's for. JB: How do you think the arts and the sciences differ? ENO: If you asked 20 scientists what they thought they were doing, or what they thought the point of science was, I would think that most of them would come up with an answer something like, we want to understand the world, we want to see how the world works. If you asked 20 artists the same question ÷ what are you doing it for, what does art do for us ÷ I guarantee you'll get about 15 different answers, and the other five will tell you to mind your own business. There is no consensus whatsoever about what art is there for although some people will say, well, it's to make life more beautiful. Here I am, an artist ÷ who reads mostly science books ÷ like most other artists. I know very few artists who read books about art. Why, I ask myself, is there not a conversation of that quality in the arts? Many artists normally are talking about science, they're not talking about art ÷ there is not a developed language, for having a conversation about the arts. I'm gradually arriving at some sort of a theory of culture that is getting a few adherents now. I've been talking about it awhile, and I've slimmed it down enough that it is communicable in less than two days. The first assumption is that all human groups engage in something that we would call artistic behavior ÷ if they are at all capable of it, that is if they are beyond the most basic problems of survival ÷ and even when they aren't, they will engage in decorative, ornamental, and often very complex stylistic behavior. This takes a big chunk of their resources ÷ it takes a lot of energy. So the first question is, why would that be the case? If it is the case, one would assume that it's doing something more than just mildly entertaining ÷ it's doing something important for us. The second assumption is this thing I mentioned earlier about assuming that culture is in some sense a unified field, in the same sense that life is a unified field. So that one wants to come up with a language, just as biologists want to come up with a language within which you can discuss whales and amoebas without having to invent a whole new set of terms for them each of them. You want to have some structure underneath that would say, yes, we can locate those things within the same pantheon of possibilities. JB: So is this an artistic analogue to a unified field theory? ENO: I want to find a way of talking about culture, so therefore if I talk about it, I have to be able to include everything from what's considered the most ephemeral, menial, and unimportant version of culture ÷ haircuts, shoe designs ÷ to what are considered the most hallowed and eternal examples of it. Now when I try to think about what it does for us, I try to think what happens to you in certain specific situations. For example, let's take this pair of designer sunglasses that happen to be on the table in front of me. They're very styled. They don't have to be like that. Glasses don't have to be funny, oval, weird-shaped looking glasses, space-age type glasses. As I put those glasses on, I'm not only keeping sun out of my eyes. I'm also engaging in some kind of game with myself and the rest of the world. What I'm doing is I'm entering into some kind of simulator. I'm saying, "what would it be like to be the kind of person that wears these kinds of glasses?" What I mean by that is, I'm not actually abandoning who I am and becoming somebody else; I'm for a while entering into a game where I suddenly become this person that's a different person from the person you've just been talking to. With all fashion, what we do is play at being somebody else. We play at inhabiting another kind of world. If I decide to cut my hair short and dress like a tank commander, I play with the resonances of kitsch, militaria, dominance, and surrender , and control, and strength and weakness and all those sorts of things ÷ I'm role-playing effectively, when I'm making fashion choices. If I go to a cinema and I look at a film, what I do is take part in another kind of role-playing. I first of all watch a world being constructed, and if the film is any good I understand what the conditions and rules of that world are, and then I watch a few people who represent certain sets and bundles of characteristics, and I see what they do and how they relate to that world. Essentially what I'm watching is a kind of experiment that's been set up. I'm watching what would it be like if the world was like this, and what would it be like if this kind of person met that kind of person in that kind of context? JB: Is this something one does consciously? ENO: This kind of playing with other worlds, this ability to move from the world in my head to the possible world in your head, and all the other millions of possible worlds that we can imagine, is something that humans do with such fluency, and such ease, that we don't notice ourselves doing it. We only notice how powerful that process is when we meet people who can't do it ÷ severely autistic children, for instance, who are incapable of switching worlds ÷ who in many senses can appear completely intelligent, but they are incapable of seeing that there is any world other than the one that they perceive at this moment. This makes them incapable of two very important things: they can't cooperate easily, because to cooperate you have to understand not only your world, but the world of the person with whom you're cooperating, because you're trying to make a new common world, so you have to see where the other two worlds are. And they can't deceive. Autistic children also are incapable of deception, because they could not understand how they could create a situation in which you could see a different world from the one that they believe exists. To a very large degree, cooperation and deception are the two things that distinguish human beings from the other animals. We have noticed now that some of the higher primates have the rudiments of cooperation and deception, but compared to ours they really are very rudimentary. My argument is that what the constant engagement in culture does for us, is that it enables us to continually rehearse this ability we have ÷ the use of this big part of our brain that is involved in postulating, imagining, exploring, extrapolating other worlds, either individually or cooperatively. This is the point at which there is a deep connection between art and science: each is a highly organized form of pretending; of saying "let's see what would happoen if the world was like this." JB: Let's move on to your ideas about metaphors. 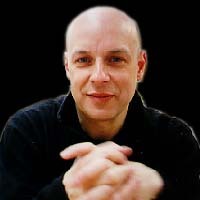 ENO: "The other worlds theory" you might say, is one part of my idea. The other part is what I call "the metaphors theory." Humans actually codify most of their knowledge not in terms of mathematical tables, sets of statistics and scientific laws, but in terms of metaphors. Most of the things we normally have to deal with understanding are complex, fuzzy, messy, changing, and in fact poorly delineated. We don't actually know where the boundaries of them are, let alone being able to make clear questions about them. We spend a lot of our time as ordinary humans navigating through complicated situations with one another, that require constant negotiation, and constant new attempts to understand. Science is, of course, one extreme version of this process. Science works by trying to say, okay, I can separate off this piece of the world from the rest. Effectively we can say, I've separated that off, and then I can make some theories and predictions about it. Science therefore enables us to come up with a structure upon which we can build useful metaphors. This is why artists are interested in science ÷ it's because science keeps coming up with big ideas, like chaos, like complexity, that we then think, ah yes, perhaps that's how a lot of things work. Then we have a new metaphor. We don't have to fully understand the science that made that metaphor. A lot of those kinds of metaphors derive from science, but a lot of them derive from literature, poetry, music. We live in a big construction of metaphors ÷nearly all of our knowledge is rather fuzzy in that sense. One of the things that artists do is invent metaphors, break up metaphors, challenge them, pull them apart, put them together in new order and so on. One of the things art does also is to remind you constantly of this process that you're most of the time engaged in ÷ the process of metaphor-making. I am interested in the work of George Lakoff. I thought that Metaphors We Live By was a very interesting book, because it pulls you away from the old model of the mind having two departments, the rational department and the kind of intuitive department. It says, no, it's not quite like that, it says there's a continuum, that there are places where we can be strictly rational, such as when I'm doing my accounts with my calculator, when I'm making precise estimates of how I'll make something and what it'll be like. I can use all of the purely rational tools for that. But then there's a whole continuum, which is actually unbroken as far as I can see, where at the one end I can be entirely rational, then I can be pretty logical but I have to make a few guesses, right down to another end here where it's pure hunch. It's absolutely pure hunch. JB: How does it all come together? Or, does it come together at all? ENO: Mostly we're given the impression that there are just these two separate ways of doing things. However, I believe that one is constantly navigating along that whole spectrum. And that process of navigation is a process of donning different kinds of metaphor, accepting the usefulness of different kinds of metaphor. Once again this hasn't been really worked on by art writers. Again, any of the interesting work on this has been done from the position of science, and has therefore tended to want to address that end of the spectrum of things. If I drew that spectrum of the highly rational to the highly intuitive, what I would have to say is that we don't spend much of our time at either of those extremes. We spend most of our time negotiating somewhere along the middle. You have art writers who constantly celebrate the "intuition" extreme, and think that this is the sort of apex of human existence, and you have scientists who by default almost dignify the other one. That's where they live, or that's where they'd like to live. They want to be able to make the kind of statements that push that boundary. What I would like to see is a conversation that admits that we spend most of our time somewhere in the middle, and we ought to find a way of thinking about it. I suppose at the root of all this is the feeling that possibly the only way that humans can remain cooperative is by those of us who are artists or who are interested in the arts realizing that we have some kind of a job to do. It's no good any more as far as I'm concerned for artists to just take the Bohemian attitude of, oh, it just comes out of me, and I don't know what I'm doing, etc. I just can't stand that, I don't want this romantic attitude that says artists shouldn't be part of this planet. This is a real job, and it has to do something. JB: How do you do this job? ENO: I wrote to Richard Dawkins recently who had just given The Richard Dimbleby Lecture on BBC1 in which he said that England always celebrates the arts, and doesn't celebrate the sciences. In fact he's right; there is a sort of liberal humanistic culture here which acts like art is wonderful and science is something that people should just get on with, and tell us when you've come up with a new washing machine or something. He gave the impression in his lecture that there was therefore a much better understanding of the arts than of the sciences, and I said I felt exactly the reverse was true, that people had a very poor understanding of the arts, and the reason they could happily waffle on about it was because their waffle was unchallengeable. There's such a poor conversation about it that you can say whatever crap you want to, and nobody's going to call you on it. The other thing is that everybody recognizes the power of science. We recognize the power of cloning technologies, of nuclear weapons and so on. Everybody knows that science is powerful and could be dangerous, therefore there's a whole lot of criticism on that basis. What people don't realize is that culture is powerful and could be dangerous too. As long as culture is talked about as though it's a kind of nice little add-on to make things look a bit better in this sort of brutal life we all lead, as long as it's just seen as the icing on the cake, then people won't realize that it's the medium in which we're immersed, and which is forming us, which is making us what we are and what we think. Dawkins wrote back saying my letter came at a good time because what he's thinking about more and more is memes, rather than genes, and of course memes is what culture is about. Culture is the landscape of memes. JB: What prompted you to contact him? ENO: I had written a short letter. I'm sure he gets loads of mail, I didn't want to burden him, especially after a television lecture. But the appalling thing is that when you find out how much mail people do get, it's virtually zero. One of the things that changed my life a few years ago was listening to a radio program we have on Sunday evening called "In Committee." It's the reports of the parliamentary select committees, which like your American committees have the task of addressing particular issues and then making a recommendation. There had been one very hot issue which was about whether there should be a third nuclear power station in a particular area. It had been a big media thing for months and months. Finally the report came, and the chairman of the committee read the report, and he said that well, in the six months that the committee has been sitting we've had a tremendous public response on this issue. We've received almost 150 letters. I was amazed! ÷ this constitutes a terrific response? You suddenly realize actually that a letter can make a difference. What makes a difference is knowing that somebody's listening, and paying attention. I've written a few things for papers and so on, and what counts is knowing that the conversation has gotten through. I don't care about the figures, that the piece reached 500,000 readers ÷ for it doesn't make any difference if they didn't read it. But if you know that it reached two or three, and you then enter into a conversation with them, then that's made a difference. I'm sure you know that. JB: Where do you see yourself going with these ideas? ENO: One of the understandings I look for is anything that starts to take seriously the culture that ordinary people make. I find this in books such as Pattern Language by Christopher Alexander and How Buildings Learn by Stewart Brand. It's important to seek to dignify and take seriously what people who don't consider themselves experts and professionals do with their time. I would want to see the same thing done culturally, that we start to recognize that people are cultural beings. They can't help themselves. It's not a question of making a decision to become an artist. You can't help yourself, to some extent. That's an important psychological step, because it says to people: you do it. There's another level at which I would like to say that much more profoundly; it's something I didn't talk about at all because it's a difficult issue to explain. What is cultural value and how does that come about? Nearly all of the history of art history is about trying to identify the source of value in cultural objects. Color theories, and dimension theories, golden means, all those sort of ideas, assume that some objects are intrinsically more beautiful and meaningful than others. New cultural thinking isn't like that. It says that we confer value on things. We create the value in things. It's the act of conferring that makes things valuable. Now this is very important, because so many, in fact all fundamentalist ideas rest on the assumption that some things have intrinsic value and resonance and meaning. All pragmatists work from another assumption: no, it's us. It's us who make those meanings. Culture is a way of getting people to that point of understanding. The work of a lot of modern culture is to say to people: you're making value. When Marcel Duchamp exhibited a lavatory, in what he called an act of deliberate aesthetic indifference, what he was saying was, "look, I can put anything in an art gallery, and I can get you to engage with that thing in a way which makes it valuable." He was quite clearly saying that it's the transaction between you and it, and this context, which creates the value. This is something that anyone who deals with world finances would probably understand; value is conferred and the result of a system of confidences among people. But it is not something that religions generally understand. It is certainly not something that fundamentalists understand. For me, so many of the really critical bottleneck type problems of our time come from that difficulty of understanding ÷ that it's humans that make the value in things. It didn't get there, it wasn't in there, it isn't there all the time, it wasn't made by somebody else and it's left there for us to find it. We made it. We put it there. The engagement with culture is a way of understanding that. Of course, art history of the past has always used it to buttress that old idea ÷ ah yes, Michelangelo's Pieta is beautiful because these proportions have some kind of divine golden mean type resonance, and it communicates through to us ÷ the value is in the thing and we're like a radio receiver. That transmitter/receiver model is an old picture which I don't accept any more. The value is in the transaction. The object itself can be almost irrelevant ÷ as was Duchamp's lavatory. He could have chosen a spade, or a bicycle wheel, in fact. What he did was create the situation where he said, here, viewer, come in and make some value. And a lot of 20th century art has been about that ÷ about reminding us that we make things valuable ÷ that they don't preexist in a valuable state.